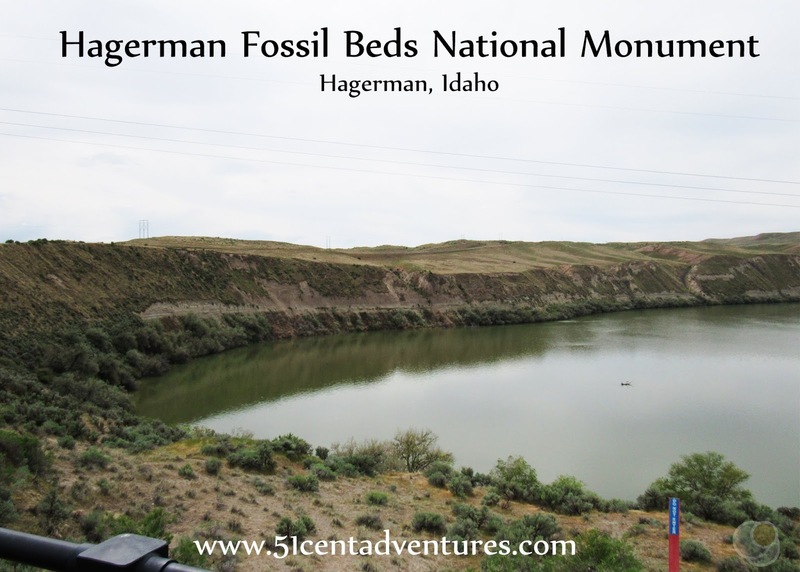 Before we crossed back over the Snake River we decided to take a 2 mile detour to the Hagerman Fossil Beds National Monument. This is apparently a pretty big deal in the world of fossils. Idaho's State Fossil, The Hagerman Horse, comes from this area. But from a tourist standpoint its a bit of a disappointment. There aren't any fossils on display here, you can't even see a fossil quarry. There are a couple lookout areas that give you a nice view of the Snake River. Signs in the National Monument told us that the Monument's Visitor Center was located a few miles away in the town of Hagerman. Brandon and I decided we'd better stop at the Visitor Center before passing judgment on the National Monument. We drove back to Highway 30, crossed over the Snake River and drove into town. We found the Visitor Center on Main Street across from the High School. It's a small Visitor Center so I assumed we'd be in and out of there in 5 or 10 minutes. 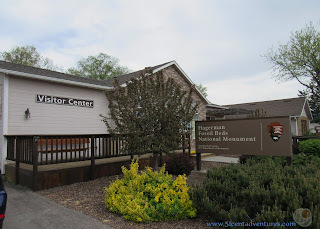 Instead I was pleasantly surprised by the Visitor Center. There were interactive and informative displays inside the center. And the staff was so welcoming and accommodating. Usually I can see National Park staff visibly cringe when I walk into a Visitor Center with my four rambunctious children. But the staff at this center greeted us happily and didn't seem to mind my children's loud voices. One of the Rangers asked if we'd like to do the Junior Ranger Activities. We usually don't do these things because they just seem like extra work for me, but the ranger assured me it wouldn't take much time or effort. The twins were interested, my other two kids kind of participated. We had to do some activities in a work book, watch a short movie, talk to a ranger, and hike on a trail. The kids were so excited to receive these wooden Jr Ranger Badges when they were done. I liked the displays in the Visitor Center.. 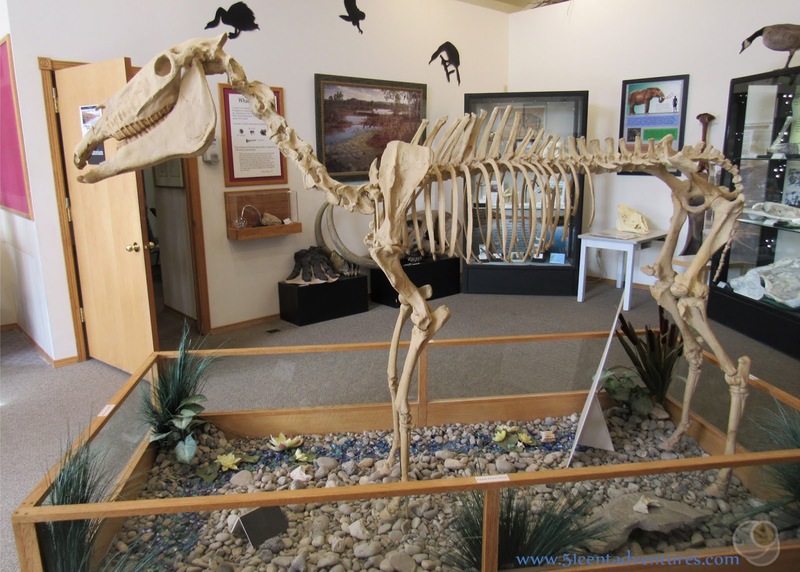 There was a replica of the Hagerman Horse Fossil. This made up for the lack of visible fossils at the fossil beds. The kids also had fun playing with one of these sand/topography demo things. 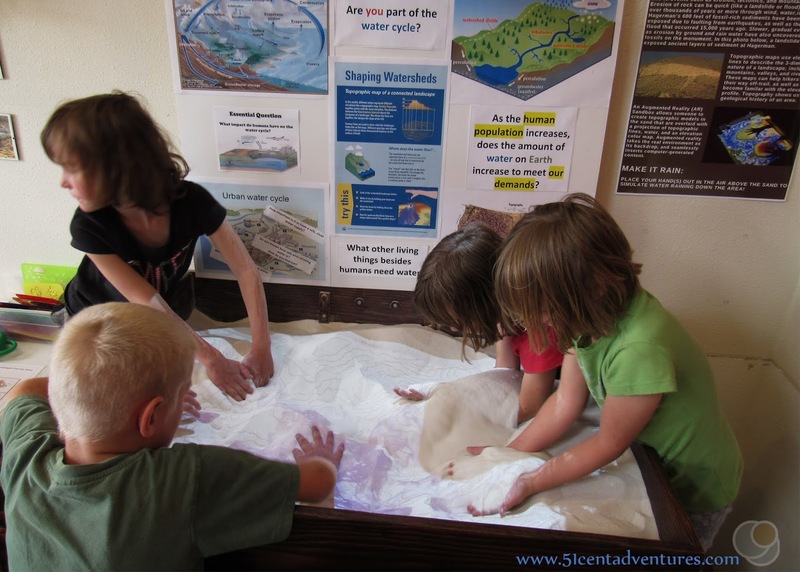 Hands on displays are always appreciated. We ended up staying at the Visitor Center for over 30 minutes, which given it's small size was kind of amazing. Then it was back into the car for one more stop before we were done for the day. Recommendation: The fossil beds at this National Monument leave much to be desired, but the Visitor Center is very welcoming. Hagerman Fossil Beds National Monument is far from being a "must see" attraction, but it is a nice place to stop and stretch your legs if you are passing through the area. Directions: The town of Hagerman is about 8 miles south of Exit 141 on I-84. Highway 30 runs right through the middle of town. The Visitor Center is located in the center of the town. 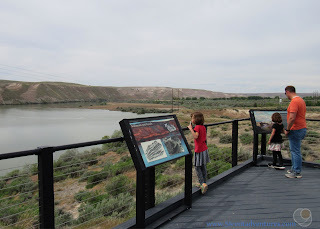 The fossil beds themselves are located south of town on the southern side of the Snake River. Places Nearby: The Billingsley Creek Unit of Thousand Springs State Park is north of Hagerman. It's a great place for fishing or for hiking, biking, or riding horses.